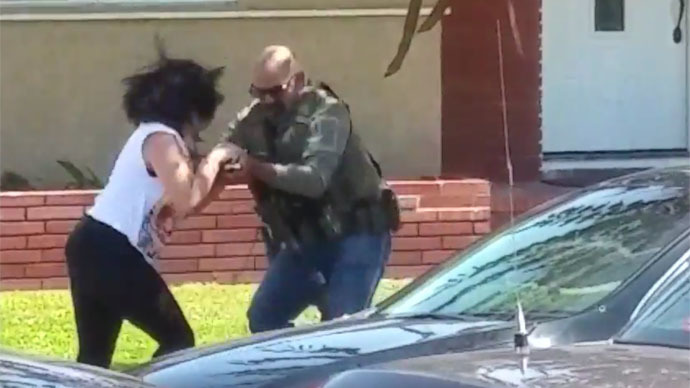 A California woman was videotaping an arrest in a Los Angeles suburb recently when a rifle-toting police officer charged towards her and destroyed the recording device. Now federal authorities say they’re investigating the incident. The video footage surfaced on the internet over the weekend, showing how the encounter unfolded in the city of South Gate, which is a few miles from downtown Los Angeles. In the 53-scond clip, a woman is seen holding what appears to be a small camera or cellphone in front of her face, with the police activity occurring around 15 feet in front of her. Halfway through the recording, an officer with a rifle in tow rushed towards the woman and reached for the device. A loud noise is audible as the officer smashes the camera on the ground and boots it away. He was then filmed walking away from the scene as the woman went to pick up what was left of her device. “Did you record that?” she asks on tape. Footage taken from a few feet away was uploaded to YouTube on Sunday and watched over 40,000 times in 48 hours. On Tuesday, NBC News reported that the incident was under investigation. The Los Angeles County Sheriff’s Department told NBC they are also investigating the event. According to NBC, US Marshals were conducting six arrests in South Gate while the woman attempted to film. It’s not yet clear if she was asked to stop recording prior to when the YouTube footage begins, or if the police had offered her a warning of any kind. “I have the right to be here. You’re making me feel unsafe,” the woman is heard saying in the clip before being charged by the officer.